Australian Frequent Flyer board has gone into meltdown, perhaps we'll hear shortly from AFFers who may have been on board. I'm not yet aware of any AFF'ers on board, however some social media aware pax who were on board have been posting information which we'd been collating links to. I'd copy/paste the details out of the thread, but can't extract it even from my cache at the moment. Needless to say, my initial take on all of it having read pretty much every news & wire report - is that the wire services (AP & Reuters specifically) got the story monumentally wrong from the outset. They used unreliable local wire services, conflicting reports on the ground, and built a worse case scenario story that wasn't even close to the truth. The AP wire story was also embarrassing in that it misspelt the name of the airline, adding a U into the name (thankfully which they've since fixed). It also seems that Reuters may have even fabricated a quote which they claim was made to the news channel CNBC by an official of QF. All in all, some wire services need a boot in the pants over this. Terrible reporting. The damage to the top of the wing looks interesting! See the bit sticking out from the wing above the engine. 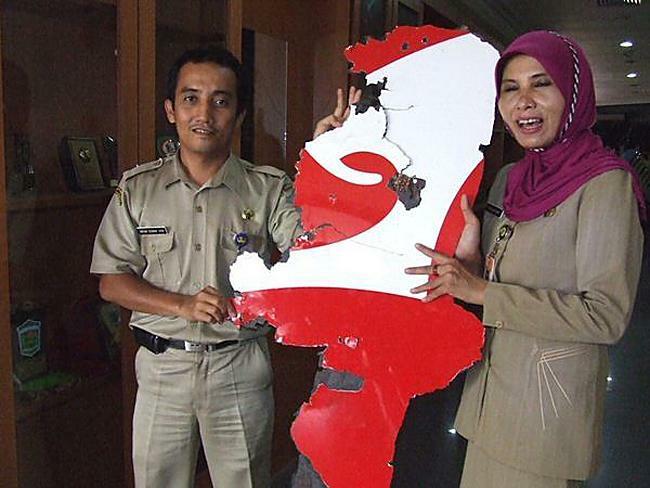 Someone also had a photo of two Indonesian officials with the debris that fell to earth at Batam just before AFF went down again. Comparing that image to the one Sydney Morning Herald has of the plane after landing at SIN, there can be no doubt despite QF PR claims to the contrary that the Batam debris belong to QF32. The pieces and engine are an exact match. If the tail falls off, won't you in essence lose control of the aircraft? In most cases, YES! The tail is a critical component of flight. If it really was VH-OQA, I got lucky, as I was on that one back from SIN to LHR on the 2.nov ! Even more confident that we're looking at an uncontained engine failure. 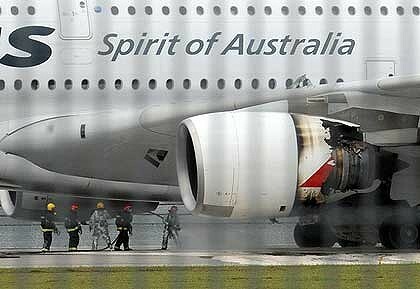 People are already commenting on two such events in a short time period for Qantas. Keep in mind that it is likely two such Rolls-Royce events in short order (3 if you include the Trent 1000 failure). From another forum: "I believe the plane is VH-OQA (Nancy Bird) which recently received heavy maintenance in Germany"
The T1000 issue, while completely unrelated, shouldn't be discounted if you take the expert journalists from FlightGlobal at face value. Are the QF 787's getting trents? Engines do not necessarily undergo maintenance at the same time as the airframe. I imagine the boys in Derby will be in for quite the day tomorrow.